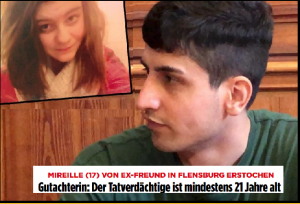 GERMANS, already outraged over the light sentence (8-½ years) given to another Afghan Muslim, 17, for murdering a 15-year-old German girl in Kandel, forced the court to try this latest Afghan Muslim migrant as an adult for murdering his girlfriend, Mireille, 17, in Flensburg. 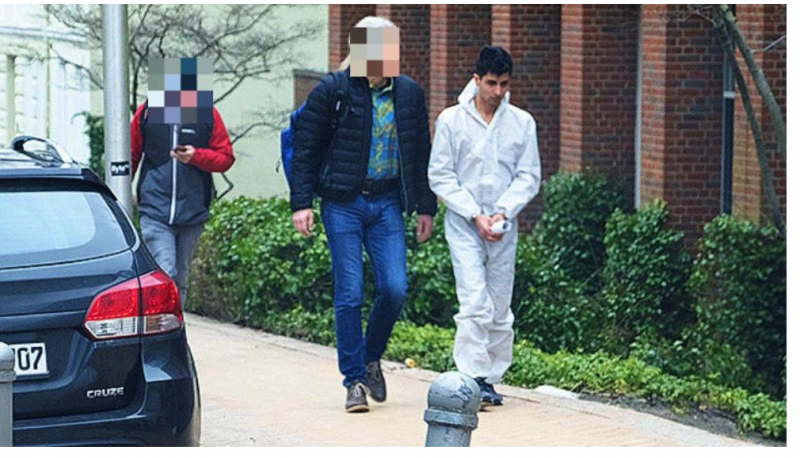 Daily Mail (h/t TherezaB) The asylum seeker, identified as Ahmad S. due to German privacy laws, was found guilty of stabbing 17-year-old girlfriend Mireille 14 times at her flat in Schleswig-Holstein in March last year because she ended their relationship. The other day I drove by a Presbyterian church in the neighborhood and it had a huge poster hanging across the front wall. It was blue with white letters and It said WE CHOOSE TO WELCOME IMMIGRANTS AND REFUGEES…I shook my head and thought about the dummies in Germany who did the same and are paying heavily for their stupidity. This town has also a mosque and a school of knowledge, which is an islamic center most likely paid for by Saudi Arabia which won’t allow any other religion or house of worship , but islam and mosques. does anybody think merkel’s muslim colonization of germany is revenge for the german people rejecting communism? 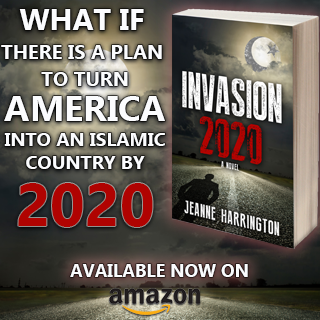 The state sanctioned Muslim invasion of the West is punishment from Marxist governments on their successful, wealthy, hardworking, independent capitalist middle class. Without the influx of the lowest scum the planet has to offer there’s no reason or justification for high taxes, wealth redistribution, and big government. The Marxist want everyone poor apart from a few. Orwell’s 1984 is their dream world. It so sad that people are willing to vote for this, but for sone reason they are. Twitter and Facebook have brainwashed them and silenced them, while a Marxist education system has left them bereft of original or individual thought. Supposing Germany gets enough courage to toss out all the illegal muslims. Germany needs to take away women’s right to vote and of course any men who supported open borders, otherwise they’ll get the same problem. Spewed forth from the Bowels of Hell — Dirty, Demonic Fiends who stalk Christian nations voraciously seeking non-Muslim prey. 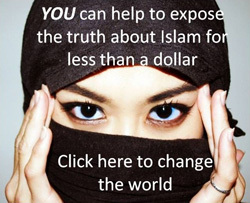 Western governments and intelligence agencies know that the Bloodthirsty Quran commands SATANIC RITUAL ABUSE TORTURES and SLAUGHTERS of non-Muslim innocents. It’s why the EU, European and other Western GOD HATER leaders massively imported Muslims into our formerly SAFE, FREE, HAPPY Christian nations — to wage VIOLENT JIHAD against intensely hated white, European Christians. What does “life” mean in Germany? A few years, months, maybe? 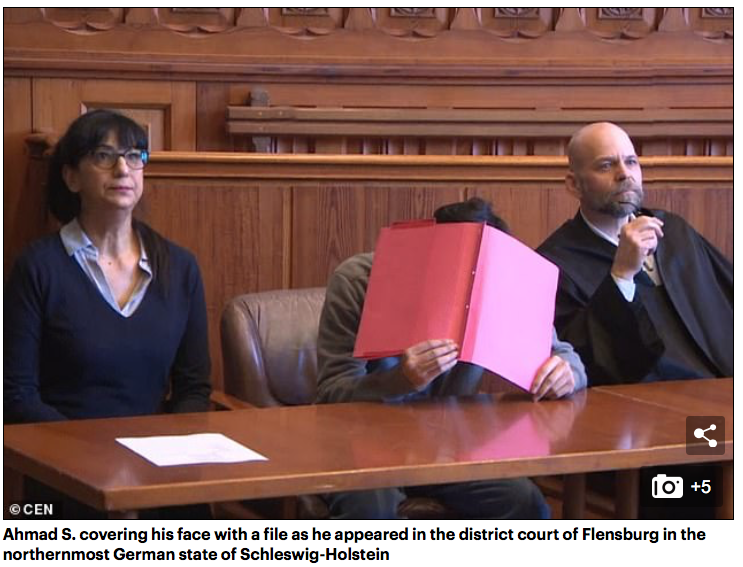 I’m sure the German “legal system” will figure out a way to lessen his sentence, ease his butthurt and apologize for the inconvenience they caused in his life. In France, apparently, “life” means 20 years. By “Life”, I hope they mean until next Wednesday. I don’t think Germany has the death penalty. No EU country has the death penalty. It is part of the criteria to be a member. That decision will come back to haunt them. The Tower of Babel #2 has already been setup. All that’s needed is for the final Nimrod aka the 1st Beast to appear. Be sober everyone and don’t take the blue pill like we all used to before seeing the truth. ‘Life’ in Germany means 15 years only before eglible to parole unless the court rules the crime to be particularly severe. Yay! I can’t believe Germany will give life in prison & actually QUESTION the Muzzrats age! Germans generally have just 1-2 children, so Muslums are wiping out families. I imagine German prisons will be filled up shortly with their new “guests”. Majority in jails are already immigrants. Ah another story of “cultural enrichment” by Merkel’s open border policy. It’s just working so well eh? Society is doing a terrible job of informing these young white women against interacting with these losers. And, even worse, a relationship with one can only end badly. Very badly. As in this tragedy. Oh well … at least that’s one less to be holding the “Refugees Welcome” signs out for the next boatload of illegals. 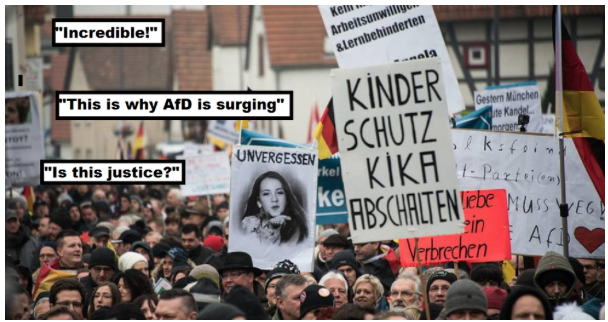 Darwinian theory suggests that such sentiments will be murdered out of the German population as time goes by. Hopefully (and quickly, if it has to be so) the gene that controls sentimentally towards the pig shaggers will be deleted from the German gene pool.